This fantastic land for sale in Jimbaran Bali is one of the most astonishing land for sale in Bali, an Astounding Property for sale in Bali Indonesia. Featuring Astounding ocean view this Amazing block of land in Jimbaran is one of our featured land sale in Jimbaran Bali listed on our Jimbaran property listings. Strategically situated in Ungasan, 10 minuts to the beach, 20 minutes to the International Airport, this Astonishing land in Jimbaran Bali for sale in Jimbaran Ungasan is suitable for villa / residential / private house. 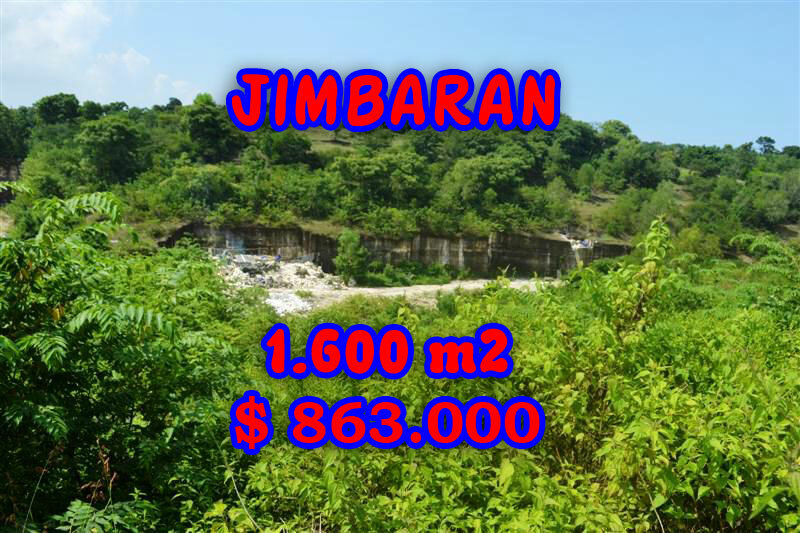 Very Reasonable land price USD 539 / m2 which considered very cheap compared to other Jimbaran land for sale this Exceptional land in Bali for sale in Jimbaran is a great opportunity for Property investment in Bali too. Bellow are the specs and the features of this Inexpensive 1.600 m2 Exotic ocean view land for sale in Jimbaran Bali. This Fantastic 1.600 sqm land for sale in Jimbaran Ungasan is one our best offer of Spectacular land in Jimbaran Bali for sale featured on our listings of property for sale in Jimbaran Bali, one of the most attractive Property in Bali available for sale on current Bali property market. =>This Astonishing 1.600 sqm land for sale in Jimbaran Bali Indonesiais situated in nice and quiet area but not too remote where you can still enjoy an absolute privacy in cozy surrounding not very far from Jimbaran hot-spots, one of the most Outstanding property for sale in Jimbaran Bali. This Exceptional Property for sale in Bali Indonesia, 1.600 m2 land for sale in Jimbaran Ungasan is proudly offered by Bali Real Property, a group of Real Native Balinese professionals focused on Real Estate development and Property investment in Bali. As local Balinese property professionals we offer a wide selection on Real Spectacular Property for sale in Bali Indonesiawith the real honest and most reasonable prices. Please compare to other property agencies ( unbelievable ) prices, especially those who are so proud of having ( costly ) international staff on their team, convinced having the largest property database, and proud of having more then ten ( 10 ) property websites. Meanwhile we can only offer a proud team of honestly native, legally competent ( and registered ), local property professionals with international knowledge. Please choose wisely. However we are not so proud of having and managing only little more then one hundred ( 100 ) property websites serving both international and domestic clients with the same treatment. The same Real property ( not the database ) with the same Real price for all. Jimbaran is one of the most Exciting place in Bali. Located about 10 minutes drive south of Ngurah Rai International Airport and Kuta. Surrounded by pleasant white sandy beaches Jimbaran is now home to several world class 5 star beach resorts, plus a few more moderate mid-market hotels. There are also many high-end villas in this area, particularly on the ridges of high ground above Jimbaran Bay. This has resulted in monikers such as the “Beverly Hills of Bali” or “Millionaire’s Row”. As one of our specialized area, beside this Exotic Property for sale in Bali Indonesia, land for sale in Jimbaran Ungasan we offer wide selection of other Extraordinary property and land for sale in Bali that suitable for private house, commercial villa / resort or for your profitable property investment in Bali that offer a quick beneficial return . Beautiful Ocean view land in Bali for sale in Jimbaran Uluwatu, Magnificent Beach front land for sale in Jimbaran Nusadua, Attractive cliff land in Jimbaran Bali for sale in Pecatu, land in Jimbaran close the beach for sale in Tanjung Benoa, land for sale in Jimbaran Sawangan, Ungasan, Balangan and Kedonganan Jimbaran Bali.